For those who are unfamiliar with the term GPS, it stands for Global Positioning System, and is a method of locating a receiver in three dimensional space anywhere on the planet. In order for GPS to operate, a network of satellites were placed into orbit, each broadcasting a radio signal. The information transmitted from the satellites is specific enough that the GPS receiver's firmware can identify its location in space, and the time that the signal took to travel from the satellite to the GPS receiver. This is termed TOA (Time Of Arrival). Using many different signals, the GPS firmware is able to triangulate the position of the receiver. The result of the triangulation of at least three satellites enables the firmware to calculate, within a margin of error, where the device is located in terms of its latitude (East-West) and longitude (North-South). Each satellite contains an atomic clock which is extremely accurate, and is continually synchronized with the other members of the network. This is important for location accuracy, but it also means that anyone with a GPS receiver also has a precise time piece, because as well as transmitting location information, the satellites also transmit time and date information. 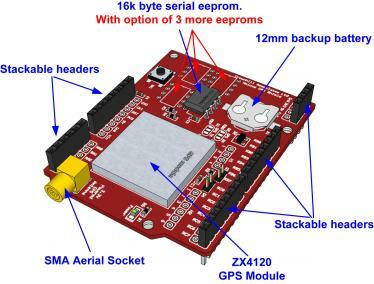 GPS shield The Amicus GPS shield contains a 16 channel ZX4120 GPS receiver, as well as a 16k byte (128 kbit) serial (I2C) eeprom, and a 3 Volt, 12mm battery socket in order to maintain the receiver's built-in RTC (Real Time Clock). An SMA socket allows attachment of the GPS receiver's aerial.